The Angry Birds Movie will not hit screens until the middle of May, but since the official sets are already in stock, we have some impressive Angry Bird themed creations to share with you. 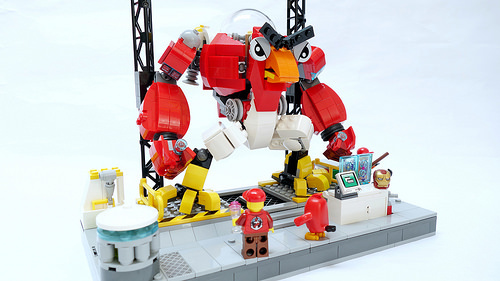 Kelvin Low does his best to help birds defeat greedy pigs by summoning up Tony Stark’s engineering talents. The result is the brutal Birdronica Mark 1. Take a moment to appreciate the iconic cartoonish style of the mech; those exaggerated proportions and the expression on the mech’s face are hilarious. There’s even a tiny cockpit on top. You can check all the details on the creator’s Flickr stream.